Tax credits to buy insurance on the individual market. Incentives to sock money away in Health Savings Accounts. Limits on employer-sponsored plans. High-risk pools to cover the sick. These are some of the ways Tom Price, Donald Trump's choice as Secretary of the Department of Health and Human Services, would replace Obamacare. 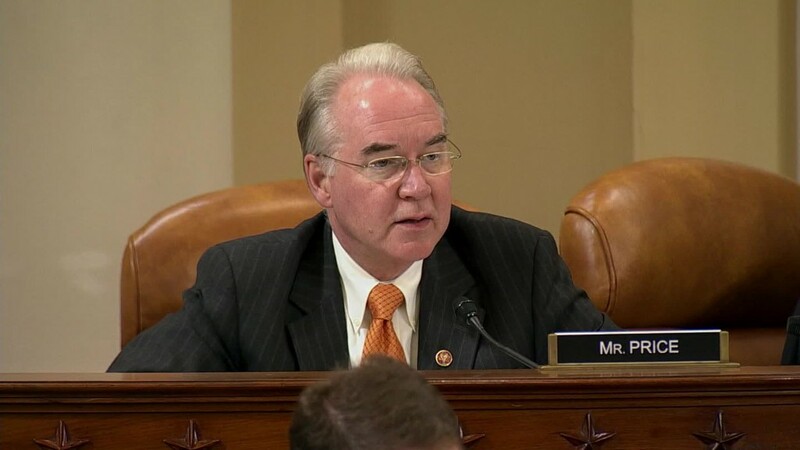 An orthopedic surgeon who chairs the House Budget Committee, Price has long been an opponent of Obamacare. The Georgia Republican says the health reform law has hiked premiums and limited access to doctors. Price is likely to have a major impact on the Trump Administration's effort to repeal and replace Obamacare. He is one of the few Republican lawmakers with a detailed plan on how to replace Obamacare. His most recent bill, The Empowering Patients First Act of 2015, bears many similarities to Trump's vision for health care reform and to House Speaker Paul Ryan's overhaul proposal. Conservatives are cheering Price's selection, saying he will put patients first and adhere to Republican ideals. Some health care experts, however, say the nominee's plan would help the healthy and rich, while hurting those who are older, sick or poor. Buying individual coverage: Like many Republican proposals, Price would give refundable tax credits to those who buy policies in the individual market. Price actually lays out how much people would receive. The credits would be adjusted by age, ranging from $1,200 for those age 18 to 35 to $3,000 for those age 50 and up. This provision would help enrollees who make too much to receive Obamacare's federal subsidies. Middle class Americans -- a single person earning more than $47,520 or a family of four with an income of at least $97,200 -- have complained about the high cost of unsubsidized Obamacare premiums. Under Obamacare, lower-income enrollees receive subsidies that can lower the cost of coverage to just under 10% of their annual income. Obamacare's subsidies are much more generous for those who qualify. Take a 27-year-old with an income of $25,000 a year. He can receive an average of $1,920 in subsidies to pay for the benchmark Obamacare plan, which will cost an average of $3,624 in 2017, according to federal data. But under Price's plan, he'd only receive $1,200 to offset the price. Likewise, a family of four earning $60,000 would receive $8,232 in Obamacare subsidies, on average, to pay for a benchmark plan costing an average of $13,080. That family would receive only $6,000 under Price's plan, assuming there are two parents between the ages of 35 and 50 and two children under the age of 18. Those with even lower incomes -- individuals with incomes below $29,700 or a family of four with an income below $60,750 -- receive additional subsidies to lower their deductibles and co-pays under Obamacare. A large share of the uninsured are low income so they would need substantial credits to allow them to buy coverage on the individual market, said Gordon Mermin, senior research associate at the Tax Policy Center, a nonpartisan research group. Also key would be whether the annual growth of the credit would match the premium increases. It's likely it wouldn't since one of the goals would be to put pressure on insurers to keep costs down, Mermin said. Another way Price's plan would hurt the poor is the elimination of Medicaid expansion that would accompany a repeal of Obamacare. Ryan and Trump have said they would maintain some protection of low-income adults, but Price doesn't mention any substitute. Older Americans would also likely see their premiums rise under Price's plan. Obamacare restricts insurers from charging older enrollees more than three times what they charge the young. But Price's plan eliminates that rule. While Americans older than 50 would receive larger tax credits than younger folks, it would likely not cover the same share of the deductible. Bolstering Health Savings Accounts: The Empowering Patients First bill is full of incentives and protections for Health Savings Accounts, a favorite Republican policy. Health Savings Accounts allow participants with high deductible health plans to make tax deductible contributions for current and future health care expenses. Any savings they don't use can remain invested and grow tax-free. One of the goals of HSAs is to entice more people to enroll in high-deductible plans, which are seen as a way to slow the growth of health care spending since consumers must shell out more from their own pocket. HSAs are mainly used by wealthier Americans who have extra funds to put away, said Timothy Jost, an emeritus professor at Washington and Lee University School of Law. It does little for those struggling to afford their premiums and out-of-pocket costs. "It will mostly benefit people in higher income brackets who want to shelter income," Jost said. Capping employer-sponsored plans: Price would limit the tax exclusion on work-based insurance coverage to $8,000 for individuals and $20,000 for families. Obamacare also called for reining in job-based insurance, though it planned to do so with the so-called "Cadillac Tax," which imposed a 40% tax on the value of policies above a certain cap. The provision was despised by companies and unions alike, and its implementation was delayed to 2020. About 150 million Americans are insured through their jobs. The average individual policy cost $6,435 in 2016, while the family premium was $18,142, according to the 2016 Kaiser/HRET Employer Health Benefits report. Employers will likely cut back on coverage to avoid hitting the cap, Jost said. One of the simplest ways to do this is to further hike deductibles and out-of-pocket payments. The average deductible for an individual soared to $1,221 this year, up from $747 a decade ago. Pushing high risk pools for the sick: Similar to other Republican plans, Price would require carriers to insure Americans with pre-existing conditions as long as they are continuously covered. Under the Empowering Patients First plan, enrollees will need to maintain coverage for at least 18 months to avoid any surcharges. Those who don't meet that criteria can be charged up to 150% of the standard rate for two years. Price would also use high risk pools to provide coverage for those with pre-existing conditions who couldn't get policies on the individual market. In addition to current funding, he would provide $1 billion annually over three years. This is significantly less than Ryan's plan, which calls for $25 billion in funding over 10 years. Covering the majority of uninsured Americans with pre-existing conditions through a national high risk pool would cost an estimated $178 billion a year, according to a 2014 Commonwealth Fund report. High risk pools were largely shut down after the Obamacare exchanges became operational in 2014. Prior to that, 35 states maintained high risk pools for their sick residents. The programs varied, but generally the state created a non-profit association to contract with an insurer to administer the pool. The plans were similar to individual insurance policies, but often had waiting lists, higher premiums and large deductibles. They also lost a lot of money: Roughly 50% of their operating costs had to be subsidized by the state, according to the National Association of State Comprehensive Health Insurance Plans, an industry group.